PAREXEL International Corporation (PRXL): Are Hedge Funds Right About This Stock? Is PAREXEL International Corporation (NASDAQ:PRXL) an outstanding investment right now? The best stock pickers are really turning bullish. The number of long hedge fund positions that are disclosed in regulatory 13F filings went up by 2 lately. 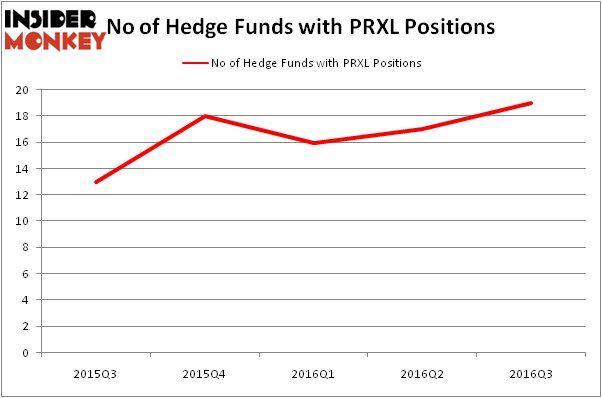 PRXL was in 19 hedge funds’ portfolios at the end of September. There were 17 hedge funds in our database with PRXL positions at the end of the previous quarter. At the end of this article we will also compare PRXL to other stocks including Acacia Communications, Inc. (NASDAQ:ACIA), Trinity Industries, Inc. (NYSE:TRN), and The Hain Celestial Group, Inc. (NASDAQ:HAIN) to get a better sense of its popularity. How have hedgies been trading PAREXEL International Corporation (NASDAQ:PRXL)? Heading into the fourth quarter of 2016, a total of 19 of the hedge funds tracked by Insider Monkey were long this stock, a gain of 12% from the second quarter of 2016. Below, you can check out the change in hedge fund sentiment towards PRXL over the last 5 quarters. So, let’s find out which hedge funds were among the top holders of the stock and which hedge funds were making big moves. According to Insider Monkey’s hedge fund database, Fisher Asset Management, led by Ken Fisher, holds the number one position in PAREXEL International Corporation (NASDAQ:PRXL). Fisher Asset Management has a $160.6 million position in the stock. Sitting at the No. 2 spot is JHL Capital Group, led by James H. Litinsky, which holds a $32.6 million position; the fund has 2.1% of its 13F portfolio invested in the stock. Some other members of the smart money that hold long positions contain Anand Parekh’s Alyeska Investment Group, Chuck Royce’s Royce & Associates and Ferdinand Groos’ Cryder Capital. We should note that none of these hedge funds are among our list of the 100 best performing hedge funds which is based on the performance of their 13F long positions in non-microcap stocks. Helen of Troy Limited (HELE): 73% Surge in Smart Money Ownership; What’... Is It Time to Buy Ultra Clean Holdings Inc (UCTT)? Smart Money Thinks So. Is Vitamin Shoppe Inc (VSI) Going to Burn These Hedge Funds? Should You Get Out of UniFirst Corp (UNF) Now? Hedge Funds Are. Vince Holding Corp (VNCE): Hedge Funds Keep Heading Elsewhere Is Cabot Corp (CBT) A Good Stock to Buy?